Today we are blogging about how to report on sales correlations between different products in NAV.  This type of analysis is well known in popular online-shops such as Amazon that create product suggestions and can be used for cross-selling, upselling and promotional actions. We want to allow analysts to answer questions such as: If a customer bought a certain product, what other products could also be of interest? 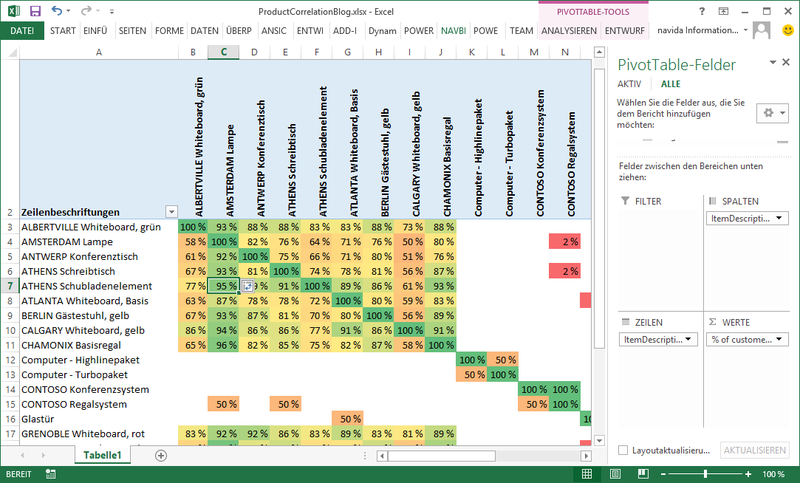 In our first part of we will show how to create this sort of analysis using NAV’s data in Excel with Power Pivot. Part 2 will explain how to embed visualisations such as this sales correlation into Dynamics NAV by using Client Extensibility. We are using a NAV 2013 R2 Cronus Extended database. 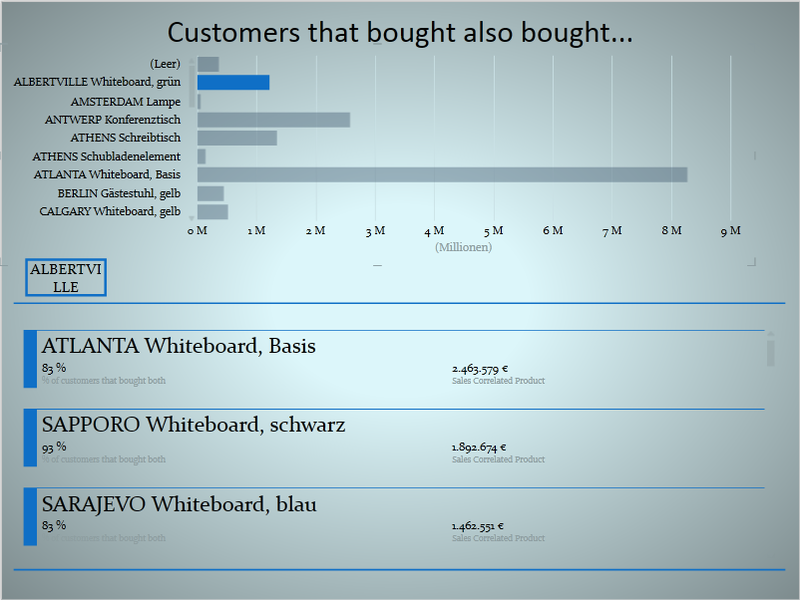 The values mean that this percentage of customers bought both the product on the line and the product on the column. 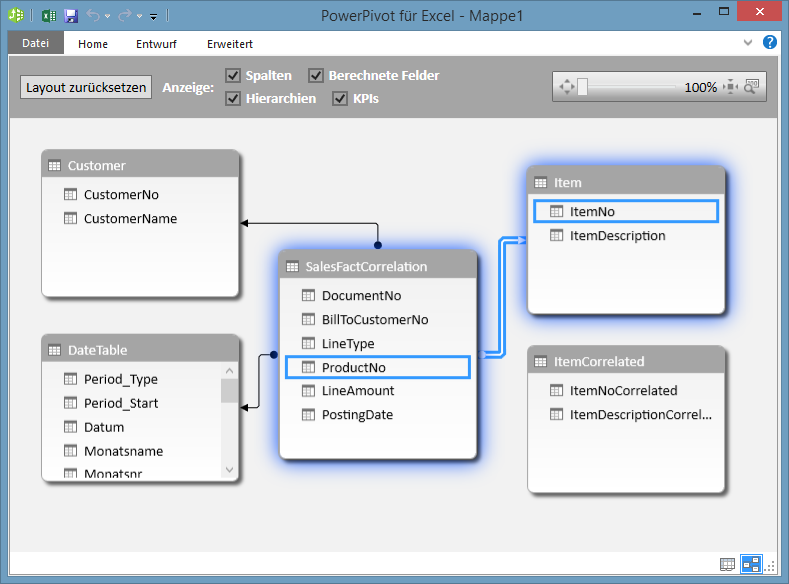 Starting from an empty power pivot file we import those four feeds as explained here. All but one tables are normal lookup-tables. Worth some words is the table ItemCorrelated in the lower right corner. It is not related to any table. 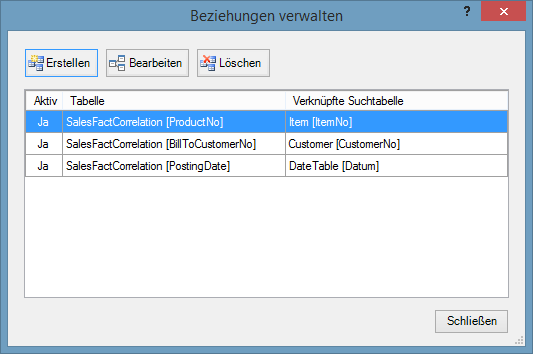 It is not related to the fact table since our field ProductNo is already related to the Item-table. We could use an inactive relationship here or could even duplicate the fact table but our solution works without any table relation. 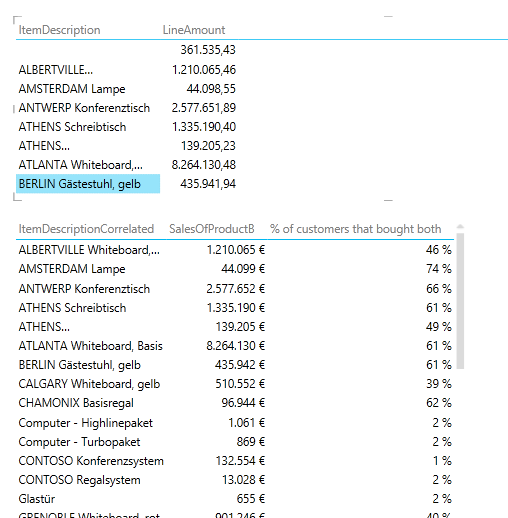 The important part is in and behind the calculatetable: it generates a filter context by creating a list of unique customers that have bought product B (ItemCorrelated). This filter is used in the outer COUNTROWS to count the number of customers that bought product B. In this section we do not need to explicitly filter on product A since the relationship that we defined works as an implicit filter. 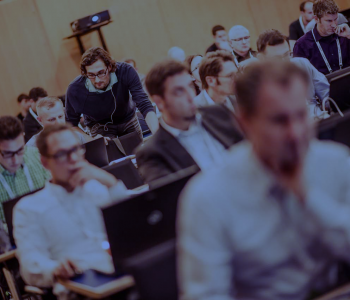 As a result we get what we need – the intersection of both products. Alternatively to the inner filter we could have used an inactive relationship as mentioned above. 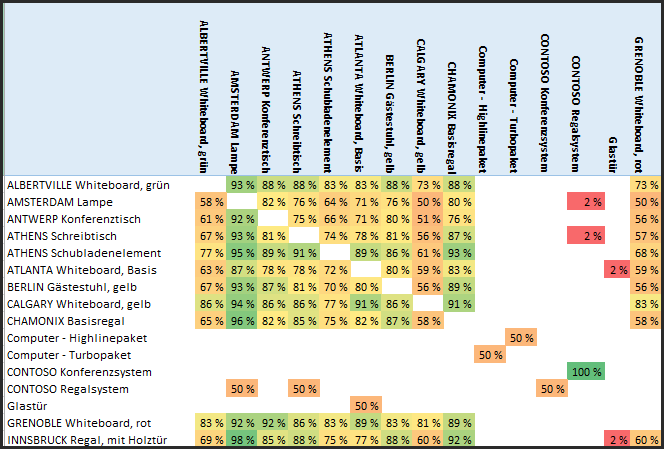 Since the 100 % in the diagonal do not provide a lot of insights (obviously all customers that have bought product A also have bought product A) we could add a new measure that will just return blanks if the product on the rows and on the columns are the same. We just need to change the layout of of both tables – in our example we changed the first to bar chart and the second to card. One of the great things about Power View is how one visualisation can act as a filter for another one on the same screen. That is why choosing a product by clicking on the data bars will act as a filter on product A thus showing the correlation of the selected product to the products in the lower part.